The Zetas have predicted that 43% of the pole shift survivors will be insane, to some degree, at least temporarily. Depression, over what has been lost, will be a major part of this. ZetaTalk Prediction 12/14/2002: The 90% die-off that we have predicted will not occur simply because of the shift. Most will die because of depression, failure to thrive, sitting down with a slight injury and not eating or drinking, as occurs after all calamities. Mankind is used to limited calamities, where a single city suffers a quake, or a single family a devastating fire. In come the Red Cross, the rescue from neighboring towns, the assistance from neighbors. Global calamities are such that no area is prepared to go forth and rescue, and all sit and wait to be rescued. Thus, all sit and wait without rescue. This reaction is reflected in the aftermath of Katrina in New Orleans, which was devastated. The statistics show mental illness doubling, primarily due to post traumatic stress reactions. A mental health crisis that has swamped this city's care facilities as surely as Hurricane Katrina's floodwaters washed over the Lower 9th Ward is about to become even worse. Suicide rates and the number of people with mental health problems have doubled. Still struggling to cope with the mental and emotional consequences of a maelstrom that swept away whole neighborhoods and stole away friends, relatives, homes and social networks - the glue that holds people's psyches together. Homeless and taking medication to reduce his bouts of anger. Sometimes angry about his situation, sometimes just frustrated. Sometimes, still angry over the hurricane. The World Health Organization, surveyed about 1,000 Katrina-affected residents of Louisiana, Alabama and Mississippi some six months after the storm. The WHO found that the number of residents with serious mental health problems had shot up from 6.1 percent to 11.3 percent, and the number with mild to moderate problems had risen from 9.7 percent to 19.9 percent. When the Federal Emergency Management Agency surveyed displaced families living in trailers and hotel rooms in Louisiana in February 2006, it found that 44 percent of the dwellers suffered from significant psychological distress. Mankind suffers shocks and setbacks, physical injury and illness and economic setbacks, so the pole shift does not deliver anything new. But the extent of the devastation means that rescue will not be forthcoming. ZetaTalk Comment 7/15/1995: Humans anticipate grieving over the loss of loved ones, who may die suddenly by accident or unexpected illness or linger for a long, sad good-by. Humans anticipate torrents of nature - volcanoes, tornadoes, floods, lighting, hailstorms, and earthquakes. These come sometimes without warning, but many times are anticipated. Humans anticipate societal problems, the loss of jobs or status, family and friends deserting one, banking failures. All this can suddenly place a human into grief, but in most cases the pending problems have been announcing themselves regularly. Any survivor of the cataclysms could have experienced a life situation where home, job, family and friends, and health disappeared. This can and does happen today to many, and not just due to acts of nature. What will be different is that the anticipated assistance from wealthy countries or one's own government will not be available. The Zetas have stated that those without will fare better than the wealthy, as they are used to doing without and working hard for a living. The wealthy will have a greater sense of loss. Are Wall Street Suicide Epidemics Real? German investor Adolf Merckle, a multibillionaire who lost a fortune on shorted Volkswagen stock, threw himself under a train. Two weeks earlier, Rene-Thierry Magon de la Villehuchet, an heir to French aristocracy and the co-founder of an investment fund whose money vanished in Bernie Madoff's alleged pyramid scheme, told the cleaning crew at his Madison Avenue office to clear out, sat behind his desk, and slashed his wrists with a box cutter. Five days before that, in London, a hotel worker entered a $750-a-night suite at the Jumeirah Carlton Tower to find the body of Christen Schnor, HSBC's head of insurance, hanging by a belt in a closet. Researchers suspect that it may be the size of the status change, the mental whiplash, that triggers suicidal behavior. In other words, it's not where you wind up; it's how far you fall. Per the Zetas, post pole shift insanity will also occur primarily among the wealthy and powerful, whose expectations of being in control will be dashed, and among those who are insecure and cling to certainty, such as being raptured. It is the rigid who snap. ZetaTalk Prediction 11/6/2004: Man sees the Sun rise in the East, hears his religion assert a connection to the gods, and thinks the laws of the land virtually immutable. Then one day the Sun rises in the NW, the church is red faced and without comment, and the government in disarray and not fulfilling their duties. Depression, hysteria, hiding in closets and seeking comfort in delusions, all will emerge, epidemic. Those most needing to be in control, such as the self serving power mongers attempting to rule the world, and those most seeking the comfort that a sense of continuity provides, such as the spiritually immature, will be most affected. Thus those that would impose martial law, and their minions in the corporations and in the military and in the ranks of government, will be mostly affected by madness. Once again, the broken link, found muttering in the closet instead of at their posts. Cataclysm crazies are affecting more than the New Orleans residents, as these statistics from Minnesota reveal. Economic problems have a domino affect on the lives of those affected. Minnesota's suicide rate is on the rise. In the last two years, the state suicide rate in Minnesota is 23.6 percent higher than its 2000 low. People who kill themselves typically suffer from multiple mental disorders, such as depression, anxiety, and substance abuse. Only when these problems are already present will economic woes push someone over the edge. When you have a job loss, most people can get through that. When you start adding loss of your spouse, loss of your house, loss of your income, loss of your retirement, you start adding up a lot of things for your mental health to sustain. The Zetas state that there will be two reactions to the devastation of the pole shift - positive and negative - and that this is a very personal choice. ZetaTalk Prediction 12/15/2002: The pole shift will bring about such shock, in great numbers, but with a difference. None will be spared, and all will be facing the same situation. Money will not put one into security, nor will hoarding goods change the odds, as the Aftertime will be a great leveler and goods will be shared by force, if not by free will. The recovery from shock takes two routes, depending upon the nature and resolve of the person affected, and this cannot be changed by others as it is a personal decision. If the individual, mentally computing the pros and cons of the situation while sitting in shock, determines that life after the shift will be too awful to contemplate, they will continue in shock. This is a clue to others about them that they have made a decision. Their creature comforts are gone, and not likely to be seen again. Their high social status is gone, others with greater talents and energy now commanding attention, and life as an underling simply not conceivable. For whatever reason, the person continuing in shock has decided not to make an adjustment, and attempting to force this will not bring satisfaction. The Zetas advise an action plan for the time immediately after the pole shift, when all will be in shock. Action aborts depression. ZetaTalk Advice 5/3/2008: Clearly, being able to face the future realistically is a great help in avoiding a breakdown. Mental illness is forced on one for a number of reasons. The genetic propensity for chemical disruption in the brain is one, which is why the propensity for mental illness runs in families. The inability to escape a situation deemed intolerable is another, the source of post traumatic stress in soldiers who are not allowed to leave the battlefield and are told to perform atrocious acts they would not normally perform. Great loss does not normally cause insanity but rather depression, and the antidote for depression is to take action. This is why we have advised that group leaders have an action plan for the hours after the pole shift, so that everyone is busy doing something, if only gathering the broken crockery and preparing a group meal. Exercise, and the mental mindset to take action to set things right, is a great cure for depression. Noctilucent clouds, mysterious glowing clouds, are on the increase. They are assumed to be ice crystals in the clouds, catching sunlight at high altitudes. Mysterious, glowing clouds previously seen almost exclusively in Earth's polar regions have appeared in the skies over the United States and Europe over the past several days. Photographers and other sky watchers in Omaha, Paris, Seattle, and other locations have run outside to capture images of what scientists call noctilucent ("night shining") clouds. Formed by ice literally at the boundary where the earth's atmosphere meets space 50 miles up, they shine because they are so high that they remain lit by the sun even after our star is below the horizon. Noctilucent clouds are a fundamentally new phenomenon in the temperate mid-latitude sky, and it's not clear why they've migrated down from the poles. Noctilucent clouds were first observed in 1885 by an amateur astronomer. 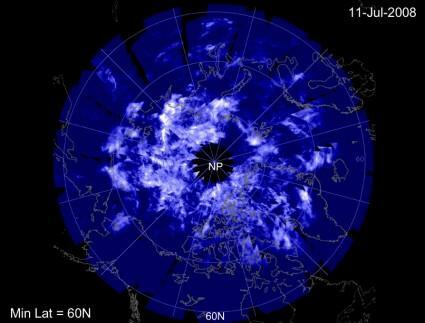 No observations of anything resembling noctilucent clouds before that time has ever been found. Other atmospheric disturbances are occurring too. Light towers, are per the Zetas caused by released methane catching ablaze high up in the atmosphere. Halos around the Sun and Moon have been observed and reported. Comet P17/Holmes appeared larger than expected due to a haze which spread the light from the comet. And a pink cloud appeared over head in London. The Zetas ascribe such phenomena to the fact that the tail of Planet X is wafting around, putting greasy elements into our atmosphere. ZetaTalk Statement 12/11/2005: In 2003, there was a period of electrical surges and outages, affecting countries worldwide. This could return, as it is the charged tail that caused this. Neon clouds, red colored and seemingly lit, were seen at that time, and these and other atmospheric displays will be produced. ZetaTalk Statement 10/27/2007: We have stated repeatedly that the tail of Planet X has returned. It hoses out from the N Pole of Planet X, which is increasingly pointing toward Earth. This tail is immense, and wafts afar. Fine red dust has been deposited on Earth from 2003 to the present because the tail was wafting past Earth. Fireballs and meteors are on the increase for the same reason. The atmosphere of Earth has been affected so that Sun halos or Moon halos appear, and odd red neon clouds appear. As the tail will increasingly return, wafting past the Earth, we can expect such displays to be on the increase! Major dams, based on solid rock which presumably should not move unless a major quake strikes the area, are increasingly becoming a concern of emergency management teams. Leakage and sinkholes are a concern at the Hanson Dam on the Green River of late. Following a record high level of water behind Howard Hanson Dam in January 2009, the U.S. Army Corps of Engineers restricted flood storage behind the dam after they became concerned about two depressions on the right abutment, increased water levels in groundwater monitoring wells, and the appearance of silty water entering the abutment drainage tunnel. 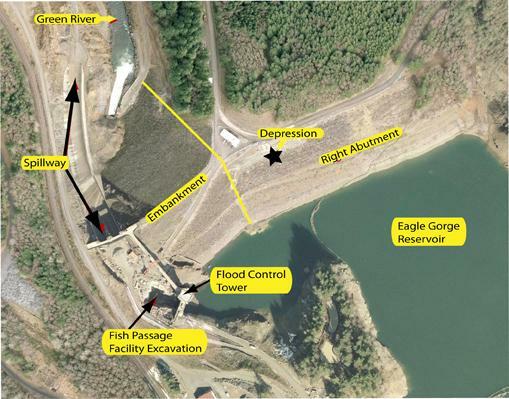 To date, engineers have excavated the depressions, installed additional monitoring equipment and conducted tests while a summer conservation pool was stored at the dam. The cause of the sink holes is, per insider information, unknown. Question: I have a relative who is head of an emergency response division for a local power company. 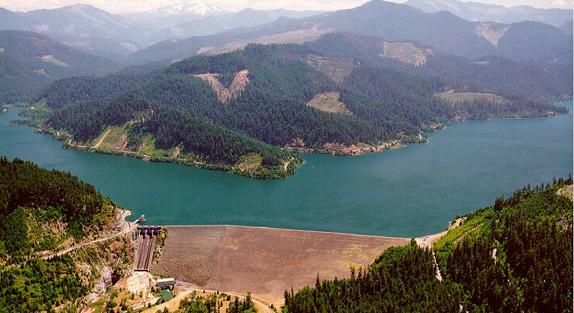 He attended a meeting concerning unstable ground and increasing leakage of the Howard Hanson Dam which holds back the Eagle Gorge Reservoir in the Cascade Mountains in Washington state. He said officials do not know what is causing the "sink holes", nor do they really know what to do about the situation short of telling people to get flood insurance. ZetaTalk Response 7/18/2009: All dams will break either during the pole shift or in the months leading up to the hour of the shift. Look at the structure of the dam! It assumes that rock holding both sides of the dam will remain in place and not move. Of course these sides will move. This is a subduction zone! There is mountain building and even where the mountains are not being pushed upward, they are moving from side to side. Some parts are more fluid than others, which are more resistant during any earthquake thrust, so there IS inevitably movement to the side. They will pull apart, slide forward or backwards, but in any case the water will find its way around the dam. That an immense catastrophe would occur should one of the major dams break is not contested. If a 40 foot wall of water swept through the Eugene - Springfield area, the aftermath would resemble a mix of the inundation zones from the 2004 Indian Ocean tsunami and the impact of Hurricane Katrina upon the City of New Orleans. If the dam failures would caused by a large earthquake, it is likely that this would be the end of the Eugene metropolitan region. The combination of bridge collapses, destruction of many buildings and the sudden, severe flood from the dam failures would make the area "resemble Hiroshima" -- as one City Councilor has privately expressed. And it is not just dams along the west coast, or the Hoover Dam, of concern. Dams in the Appalachian Mountains are also becoming unstable. The Lake Cumberland Dam above Nashville, Tennessee is becoming unstable too. The dam weakened at the same time a train derailment in the area occurred, and per the Zetas, this is no accident. Fearing a dam break that could cause catastrophic flooding in Kentucky and Tennessee, the U.S. Army Corps of Engineers began lowering the water level on Lake Cumberland. The measure was aimed at reducing pressure on the weakened 240-foot-high dam. If the dam, which is nearly a mile long, were to break, flooding in communities downstream along the Cumberland River could kill people and cause an estimated $3.4 billion in damage. Cities along the Cumberland include Nashville, Tennessee. Water has been seeping under the dam and eroding the limestone on which the concrete rests. He said crews were pumping grout into the ground to counter the erosion. ZetaTalk Comment 1/27/2007: The weakening dam is almost directly below the second train derailment, more into the mountains than the train wreck, but their proximity is significant. The rock underlying Kentucky is being pulled apart with the South going toward Florida, the East being pulled North-East toward Main, and the West being pulled down slightly along with all lands to the West of the Mississippi. The New Madrid fault line has not yet adjusted, so Kentucky adjusted to this stress. We have stated that the New Madrid will adjust, in a major way, 'soon', and these incidences hitting the news are just an exclamation point on our words!